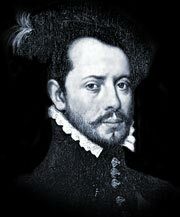 Hernando De Soto: On May 30, 1539 De Soto and his men went into Florida. They marched northward toward Georgia then turned west. His goal was to find gold. In his journey De Soto forced the Indians to give his men supplies. This led to many battles. One of the worst was near Mobile Bay. De Soto discovered the Mississippi River near present day Memphis, Tennessee in the spring of 1541. De Soto died near his discovery without finding the gold he sought. 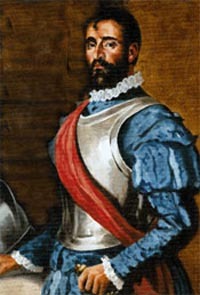 Francisco Vazquez de Coronado: Coronado commanded an expedition which left from western Mexico in 1540. He was searching for the Seven Golden Cities of Cibola. Coronado rode through northern Mexico and into what is now Arizona, New Mexico, and Texas. Coronado did not find any golden cities, but discovered the Pueblo Indians. Coronado was upset at not finding the cities of gold. He sent his men off in different directions with orders to find them. His men found the Grand Canyon instead. Coronado would not give up. He marched his army east. There he found the buffalo and grassy plains, but no cities of gold. Coronado claimed all the land over which he and his men had traveled in the name of Spain. Robert LaSalle: Robert LaSalle finished the trip that Father Marquette and Louis Joliet had started earlier. LaSalle sailed all the way to the mouth of the Mississippi River. Along the way he built a chain of trading posts. LaSalle claimed the entire Mississippi River in the name of France. LaSalle received money from the King of France. His plan was to build a trading post at the mouth of the Mississippi River at the location which is now New Orleans. He got lost and build the post on a small branch of the Mississippi River farther west. Through this the French had a valuable hold on the New World. They made money from the fur trade.The French did little to settle in the New World however. They were more interested in building an empire in Europe. One reason the French were not interested in settling in the New World was because most of the French outposts were in the cold north woods. Many colonists did not want to live under these cold conditions. Cabaza De Vaca: Alvar Nunez Cabeza de Vaca's journey remains one of the most amazing feats of exploration in the Americas. In 1527 he left Spain as partos an expedition. after failing to find treasure and becoming shipwrecked near what is now Galveston, Cabeza de Vaca an the other survivors were the first nonnative Americans to set foot on Texas soil. Facing starvation Cabeza de Vaca soon realized he needed the Native Americans. although at first he fought them, by the end of his six-year journey, he sympathized with and respected Native Americans, often trading with and relying on them. 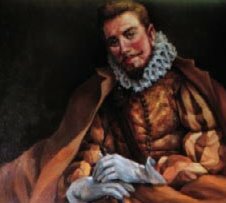 Cabeza de Vaca was the first Spaniards to live among the coastal Native Americans of Texas and survive to write about them. Hernando Cortez: Hernando Cortez was a Spanish Conquistador who defeated the Aztec Empire. On November 8, 1519, Cortez reached Tenochtitlan (now Mexico City) and was graciously received by Montezuma, the Aztec emperor. Soon after Cortez established headquarters in the capital, he learned that the Aztecs had plundered Veracruz. He seized Montezuma and forced him to surrender the attackers. Then he had them executed. He returned to the Aztec capital, Tenochtitlan. As Cortez and his men reached the heart of the city, they were attacked by thousands of Aztec warriors. Montezuma was brought out to pacify his people, but they stoned him, and later he died of his wounds. Cortez' army was surrounded and apparently doomed, but he and three others managed to get to the chieftain of the Aztecs and killed him. Confused by this apparent "miracle," the Aztecs retreated. With fewer than 500 of his men left alive, Cortez, in July of 1520, made his way back to his Indian allies. Cortez attacked Tenochtitlan again by ship the following May. On August 13, 1521, Guatemoc, the new Aztec emperor, surrendered. This was the end of the great empire of the Aztecs. Alonso Alvarez de Pineda: was a Spanish explorer and map-maker. De Pineda sailed for the Spanish Governor of Jamaica, Francisco de Garay, who sent him to explore and chart the Gulf Coast from Florida to Mexico in 1519. Captain De Pineda and his crew were probably the first Europeans in Texas, claiming it for Spain. One of the regions he explored and mapped was the area around Corpus Christi Bay; De Pineda entered Corpus Christi Bay on the feast day of Corpus Christi. He returned to Mexico to begin a settlement , he died there in 1520 in a Native American uprising.